CINCINNATI (BP)—He grew up playing catch just like any kid, except he used limes instead of a baseball and a milk cartoon instead of a glove. He often watched his dad play softball and carried him home when he got drunk after the games. Life in the Dominican Republic wasn’t easy for Albert Pujols, but now the 10-time All-Star has come to realize that God had a plan for him all along. Pujols’ early life, as told by Joe Posnanski in Sports Illustrated in 2009, was typical for a Dominican youth. As many as 50 percent of children in the nation live in poverty, according to a 2013 study released by the United Nations Children’s Fund. Pujols and his family moved to New York in 1996 to pursue a better future, but the family’s view of America took a dent when Pujols witnessed a shooting at a grocery store, prompting the family to move to Independence, Mo. Following a short stint at Maple Woods Community College in the Kansas City area, Pujols declared for the 1999 Major League Baseball amateur draft. He wasn’t on many teams’ radars heading into the draft, according to Red Sox scout Ernie Jacobs. “People weren’t sure how old the guy was. You assumed what he told you was true, but he wasn’t a great body, and his swing was a little long . . . There were a couple of scouts who liked him, who thought he could go high, but there were a lot that didn’t,” Jacobs said in a Boston Globe article in 2006. 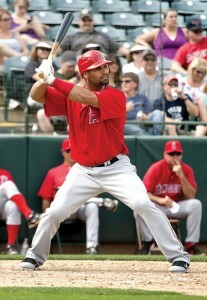 Amid the doubts surrounding Pujols heading into the draft, he was able to answer some doubts of his own. In November 1998, he trusted Jesus as his Lord and Savior just months before the draft. Pujols’ future wife played a large role in his conversion. “In the spring of 1998, my soon-to-be wife, Deidre, began sharing with me the love of Jesus. My most exciting moment came when I asked Jesus Christ to come into my life. If it weren’t for Jesus, I would not be where I am today and my life would be without purpose,” Pujols wrote in his testimony. They married in 2000 and, together, cared for Deidre’s child from another relationship, Isabella, who was born with Down syndrome. Isabella became a symbol of hope for the Pujolses, who later created the Pujols Family Foundation to promote awareness of Down syndrome. Heading into the draft a born-again Christian, Pujols was selected by the St. Louis Cardinals in the 13th round as the 402nd overall pick. After nine All-Star appearances—more than any of the 401 players drafted before him—many analysts and fans believed Pujols would don Cardinal red for the rest of his playing days. But that’s not what happened, and he left St. Louis in 2011 for the Los Angeles Angels. Many were critical of Pujols’ decision, and some went a step further by suggesting that his talent wasn’t all natural, including former Cardinal Jack Clark, who accused Pujols of using steroids. “I know for a fact he was (on steroids). The trainer that worked with him, threw him batting practice, from Kansas City, that worked him out every day, basically told me that’s what he did,” Clark said in 2013 during a radio show. Pujols responded to Clark’s accusations by asserting that his commitment to God would override any desire to take steroids. “Why would I do something like that to my family? Why would I do something like that to God? Why would I do something like that to my team?” Pujols asked at the time, according to the St. Louis Post-Dispatch. Clark later retracted his statement after the trainer he mentioned denied ever talking to Clark, the New York Daily News reported. After all the criticism, Pujols found himself in a familiar spot this season: the All-Star Game. The 15-year veteran is on pace to match the production he had during the prime of his career. Addressing the criticism that has long dogged him, Pujols still points to his faith. Pujols started at first base in the July 14 All-Star Game at Cincinnati’s Great American Ball Park.